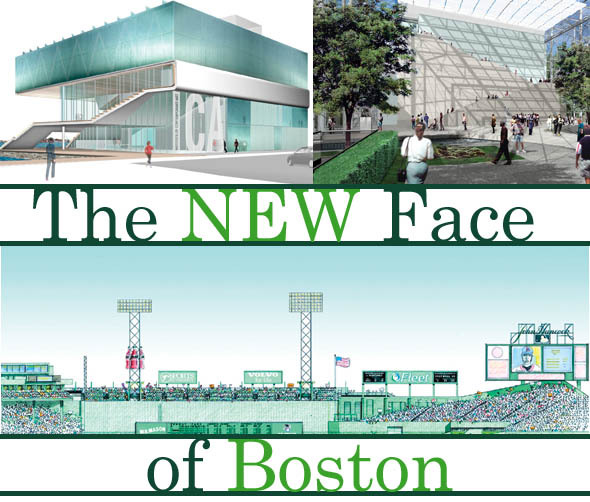 FACE-LIFT—Major projects in the works include (clockwise from above) the new Institute of Contemporary Art, the new master site plan for the Museum of Fine Arts and expanded seating above Fenway Park’s Green Monster. Boston has long been considered a city bound to its rich traditions and history. Yet the Hub has continued to re-invent itself over the years. In the 19th century, in order to expand from the small peninsula on which it was situated, the city began a series of massive landfill projects that enlarged its waterfront neighborhoods and transformed the Back Bay from a muddy marshland into the brownstone-laden, tree-lined neighborhood that now stands. Today, the city is being dramatically altered once again by the mammoth Big Dig highway/tunnel construction project, which is moving the elevated downtown expressway underground creating 27 acres of public ‘green’ space. In the wake of the massive changes spawned by the Big Dig, the New Face of Boston has begun to emerge in the bricks and mortar landmarks that make up our city. From plans for the public parks that will replace the elevated highway to the stunning design for a new Institute of Contemporary Art on the waterfront to the resurrection of the former Opera House on Washington Street—each of these ambitious projects are helping to change the face of our city. Although we may never again brazenly suggest that we’re “the Hub of the Universe” (as Oliver Wendell Holmes once wrote), Boston is poised for the future with a renewed sense of the spirit that helped the city make history in the first place. After more than a decade of construction, the end is finally in sight for the $14.6 billion Big Dig. Widely recognized as one of the largest, most complex and technologically challenging construction projects in American history, the Big Dig is helping to bring one of America’s oldest cities into the 21st century. Replacing the elevated Southeast Expressway with a brand new underground highway, the project will ease traffic congestion on a roadway that carries three times as many cars than it was built to sustain. The Mass Turnpike Extension to Logan Airport debuted in January to great fanfare. The gleaming Leonard P. Zakim Bunker Hill Bridge (already a Boston landmark) was finished last spring and is scheduled to open to traffic sometime this month (along with I-93’s southbound lanes). By early 2005, the entire project should be complete. Here’s hoping disgruntled Boston drivers can hold on a few more years. Besides easing traffic congestion in our notoriously cramped city, one of the most important benefits of the Big Dig is the 27 acres of civic “green” space that will be created in the downtown corridor when the old highway is torn down. Divided into 23 parcels, the new “Rose Kennedy Greenway” will re-connect downtown to the waterfront and the North End and make for a more beautiful and accessible city. Proposals for the new public spaces include parks, ponds, plazas, performance spaces, outdoor skating rinks, art and cultural amenities, some small-scale buildings and a four-acre “Garden Under Glass” to be built by the Massachusetts Horticultural Society. When the new Institute of Contemporary Art is finally built on the South Boston waterfront, it will become the first major art museum erected in the city in more than 100 years. Moreover, the city is hoping that the museum (along with the new convention center) will spark more development in the emerging district. Created by the cutting-edge architecture firm Diller + Scofidio, the visionary glass-walled design is highlighted by a dramatic top floor that is cantilevered out over the Harborwalk below. Establishing a permanent collection—something the ICA has never had space for—in the new four-story building is also part of the museum’s goals. The exhibit Building a Vision: Diller + Scofidio in Boston at the ICA’s current facility in the Back Bay details the development of the project, from beginning concepts to final design. Refer to listing, page 40. One of the largest art museums in the world, Boston’s Museum of Fine Arts is fast outgrowing the space it has to store its world-renowned collections. So when the venerable institution unveiled its master site plan one year ago, observers marveled at how the museum and internationally renowned architect Sir Norman Foster sought to expand and enhance the 93-year old building while respecting its history. “It was important to rediscover its roots, so we looked back to [Guy] Lowell’s original plan,” said Foster. The design re-instates the strong central axis at the heart of the museum and enhances it with a signature element—a striki ng, glass-encased “jewel box” that will enclose the museum’s two outdoor courtyards and eventually run the entire length of the building. The first phase of the project—building a new three-story East Wing with new galleries for the museum’s contemporary art and Art of the Americas collections—should commence next year. Visitors can view models and visuals of the architectural design concepts inside the museum’s West Wing entrance. It’s perhaps the city’s most hallowed ground. No, it’s not the Freedom Trail or the State House, but the home of Boston’s beloved baseball team, the Red Sox. Opened in 1912, Fenway Park is the oldest and smallest ballpark in the major leagues. In order to keep pace with free-spending rivals like the New York Yankees, new owners John Henry, Tom Werner and Larry Lucchino were eager to seek out additional revenue streams while retaining Fenway’s storied charm. That meant premium seats installed along the left and right field foul lines and at other spots in the park. This year, there will be a new fan concourse on Yawkey Way and (gasp!) seats atop the venerable Green Monster. The owners are also researching expansion of the ballpark in its current footprint rather than erecting a new stadium. Now if they can just bring a World Series title back to Yawkey Way, the long-suffering fans might forgive those steep ticket prices. Boston’s vibrant Theatre District will be expanding to a long-neglected stretch of Washington Street when the long-dormant, 74-year old Opera House re-lights its faded marquee (in the summer of 2004) after a dramatic $31 million restoration to the once-grand performance palace. The project’s developer, Clear Channel Entertainment, believes the 2,700-seat Beaux Arts-style venue will be “the crown jewel” of the dozens of theatres it operates across the country. With a greatly expanded stagehouse, Clear Channel plans to book the theatre for long runs of Broadway blockbusters like Hairspray and The Lion King. First designed by noted architect Thomas Lamb and modeled after the Paris Opera House, the theatre opened in 1928 as a memorial to vaudeville impresario B.F. Keith. Preservationists are hoping the restoration will also provide momentum for the proposed renovation of two other, long-shuttered theatres on the same block, the Paramount and the Modern. When it’s completed in the summer of 2004 (just in time to host the annual MacWorld expo), the new Boston Convention and Exhibition Center will enable the state to lure some of the country’s largest conventions to our fair burg. Boston has been unable to compete with other cities because the smaller Hynes Convention Center in the Back Bay cannot accommodate the largest and most lucrative gatherings, which bring in millions of dollars to the local economy. Designed by world-renowned architect Rafael Vinoly, the 660,000 square-foot facility (the largest building in New England) boasts a striking curved roof design that sweeps out over its entrance on Summer Street, and, when finished, will welcome visitors from all over the world. The following sites are time-honored Boston landmarks that re-opened during the past year after undergoing extensive renovations. Each sought to modernize its facilities while keeping its historical essence intact. See listings on page 45 for hours and admission prices. The Boston Athenaeum (101¼2 Beacon St., 617-227-0270), one of the largest and oldest membership libraries in the country, re-opened last September after a three-year renovation. The 200-year-old National Historic Landmark (which has been the setting for several Hollywood films including 1999’s A Civil Action) houses priceless journals, including the private library of George Washington and early American newspapers, as well as spectacular artwork by artists like John Singer Sargent and Giovanni Paolo Panini. The $30 million renovation sought to improve preservation techniques and make lecture halls and galleries more accessible to visitors. The first floor and adjoining gallery are open to the public. Guided art and architecture tours are given Tuesdays and Thursdays at 3 p.m. The Mapparium at the Mary Baker Eddy Library (200 Massachusetts Ave., 617-450-7000) is a spectacular three-story stained-glass globe of the world (pictured above) that visitors walk into along a 30-foot glass bridge. As viewers stand in the one-of-a-kind sphere, they watch and listen to a multimedia presentation that shows how the power of ideas have shaped and connected our world. The Mapparium re-opened last September after a four-year renovation that enhanced the 67-year-old attraction with music, narration and 206 new LED light fixtures, creating 16 million colors that dance before the eyes of the viewer. The Ritz-Carlton (15 Arlington St., 617-536-5700), the “Grande Dame” of Boston hotels, re-opened its doors last year after a one year, $50 million renovation, just in time to celebrate its 75th anniversary. The most visible changes are in its restored facade, but its interior has also been enhanced with new European furnishings, silk-paneled walls and patterned stone floors. The hotel’s famous afternoon tea has been resurrected in its expanded lounge, and the lobby once again displays an extensive collection of 19th century artwork. Discerning guests will also appreciate new features like remodeled bathrooms and even a fireplace butler who will light up a perfect log for couples looking for a little romance. The Longfellow House (105 Brattle St., Cambridge, 617-876-4491), home to the mythic American poet Henry Wadsworth Longfellow for more than 50 years, was a hotbed of intellectual and artistic exploration, lending sanctuary to philosophers and artists like Ralph Waldo Emerson, Nathaniel Hawthorne, Julia Ward Howe and Charles Sumner. To ensure the preservation of the 700,000 fragile historic documents it stores, the Longfellow House underwent a four-year renovation to update storage and security measures, re-opening to the public last spring. The site, currently closed for the winter season, is open mid-May through October.